Advances in computer technology and the advent of cloud computing have changed the way organisations function. The world of IT architecture has been on a long and complex journey over the last 60 years and the rate of change is showing no signs of slowing. This journey is commonly split into five stages, each one with its own specific technology drivers, underpinned by the exponential increase in processing power and decline in the cost of computer technology, more commonly known as Moore’s Law. That’s not to say each stage has resided in isolation. There has been plenty of crossover throughout the years, with some businesses - and indeed industries - being slower than others to move on from legacy technologies. While this wasn’t such an issue in the past, today’s rapid rate of innovation and unprecedented levels of competition mean businesses simply can’t afford to stand still. The focus now of course, is firmly fixed on ‘digital transformation’. That all-encompassing term is sweeping its way across the enterprise, helping businesses optimise internal processes, interact with customers in innovative ways and increase the productivity of their employees. This innovation is being enabled through the constant evolution of IT and, with open source software leading the next wave of change, it’s certainly an exciting time to be involved in the world of infrastructure. 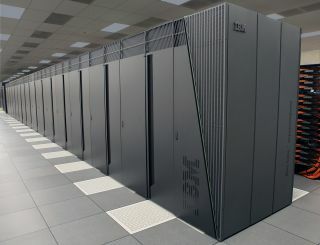 Our journey through the history of IT infrastructure starts with the centralised mainframe era kicked off by IBM in the 1960s and advances through to the cloud-based, server-less world we now occupy. In between, we’ve seen the eras of personal computers, client/server computing and web-based enterprise computing, all of which have transformed the way businesses operate. The personal computing era, for example, was driven by the proliferation of PCs and desktop productivity software tools such as spreadsheets and word processors in the early 1980s, which appealed to personal and corporate users alike. This was followed by the rise of powerful server computers that were linked to ‘clients’ – i.e. desktop and laptop PCs – to provide users with a variety of capabilities in the client/server age of the late 1980s and the enterprise computing era of the 1990s, which was driven by the need to integrate disparate networks and applications together in a single infrastructure amidst the growth of the World Wide Web. But it’s the last 15 years or so that has arguably seen the most significant technological developments, emphasising the shift of emphasis from hardware to software. As the bandwidth power of the internet continued to grow in the early 2000s, the server-less cloud and mobile computing era was born. Enabling businesses to cost-efficiently leverage a shared pool of computer resources on a pay-as-you-go basis, this period has been – and continues to be – truly transformative for virtually all industries. By leveraging the power of cloud computing, enterprises and start-ups alike have been able to cut costs, streamline their operations, increase their productivity and create innovative products and services. This era has also spawned a new generation of businesses which have been built on the flexibility and scalability of cloud technologies. Indeed, entire business models have been disrupted and those ahead of the curve have since grown into some of the world’s biggest companies. And the industry is showing no signs of slowing. Gartner predicts that overall cloud computing revenue will grow from $219.6 billion in 2016 to $411.4 billion in 2020, while Markets and Markets predicts that the cloud infrastructure market alone will be worth $209.6 billion by 2022. It’s no wonder then, that firms in all industries are racing to digitally transform and establish themselves in this rapidly expanding ecosystem. The software-driven nature of cloud computing has enabled a great number of innovations and one of the most prevalent has been the growth of open source software. Led by companies such as Canonical and publicly championed by non-profit organisation the Open Source Initiative (OSI), the aim of open source is to make powerful software available to anyone, anywhere, and fuel invention by giving innovators access to the technology they need. The key to open source software lies in its power of enabling collaboration. The idea is that it is produced and maintained by a community of developers and made downloadable for free. After all, the more people you have working on a specific product and providing feedback, the more likely major improvements will be made. OpenStack is a prime example. Since its launch in 2010, the OpenStack platform has enjoyed fantastic success and is now supported by over 672 companies including the likes of Canonical, Cisco, Huawei and Intel. The software has been built by a thriving community of developers which now boasts over 85,000 members in 179 countries around the world and it is the strength of this collaboration that has prompted hundreds of the world’s largest brands to rely on OpenStack to run their business, reduce costs and help them quickly respond to changing industry dynamics. Successes such as this have prompted a huge number of businesses to embrace open source software development and realise the many benefits it provides. As well as speeding up the development process, businesses get access to the combined knowledge of hundreds, thousands or even hundreds of thousands of experts, all for little or no cost. Development platforms such as GitHub have also helped to foster this growth by providing a central location where teams can come together to work through problems, move ideas forward and learn alongside millions of other developers. Celebrating its 20th birthday this year, open source software has become more successful than anyone could have predicted. Its explosive growth has made it into a key pillar of the technology-driven world we inhabit today, with one in three companies now possessing a full-time resource dedicated to open source projects. But what’s most exciting is that the best is yet to come. The evolution of IT infrastructure has changed the way organisations function many times over the years, but never has technology innovation been such a leveller and so readily available for businesses of all sizes.